Prepare for the Bennett Mechanical Comprehension Test (BMCT) with JobTestPrep's 2019 edition PrepPack™ and prove that you are the most qualified candidate for the job. We offer practice tests that covers all the topics in the original version of the BMCT or the new version—BMCT-II. We also offer study guides for every topic found on the exam. Start preparing today and ace the test. JobTestPrep's 2019 edition Bennett Mechanical Comprehension Test PrepPack™ covers mechanical aptitude topics seen on both the BMCT & BMCT II. The Bennett–style practice tests can be taken in real-time simulation mode (to reflect similar test conditions) or in step-by-step mode. Our pack offers two full practice tests for the BMCT II as well as additional mechanical aptitude practice drills. In some cases, the questions may seem vague, this is intentional to model the real exam. This style forces candidates to really assess the questions, and it also justifies the difficulty of the exam. Reading our detailed answer explanations will help you to increase your understanding of the test's style and content, which will help you do well on the exam. Like the real tests, the BMCT II practice tests contain 55 questions each. Also included is a study guide containing information, sample questions, and solutions on mechanical and electrical reasoning. Want to stand out among other applicants? Start preparing today. 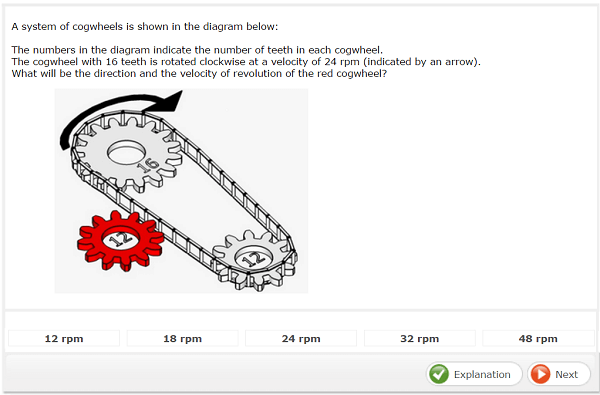 What Is the Bennett Mechanical Comprehension Test (BMCT)? The Bennett Mechanical Comprehension Test (BMCT), developed by Pearson Assessments, is a popular assessment used in several fields, including technical and industrial occupations. The test was developed to measure a person’s aptitude for understanding and applying mechanical principles. From this, an employer may infer future performance in jobs that require these skills. What Are the Benefits of Doing Well on the Test? Scoring high on the BMCT displays good spatial perception and mechanical reasoning ability. It also displays your knowledge of basic mechanical operations and physical laws, as well as an aptitude for learning mechanical processes and tasks. This, in turn, shows employers that you are a qualified candidate, thus heightening your chances of getting the job you applied for. The BMCT is a timed test. On the BMCT II, you need to answer 55 questions in 25 minutes. By practicing for the test, you can improve your timing on the exam. BMCT differs from BMCT II. The BMCT consists of 68 multiple-choice questions and has a 30-minute time limit. It can be administered on paper or online and is available in two forms, Form S and Form T.
The BMCT II consists of 55 multiple-choice questions and has a 25-minute time limit. It is administered online only. The Bennett Mechanical Test is used to identify individuals with good mechanical reasoning abilities and spatial perception. For those who plan to take the BMCT II, it is important to be familiar with basic concepts in physics as well as physics terminology. Who Is Required to Take the BMCT? Who Uses the Bennett Mechanical Comprehension Test (BMCT)? It's important to note that while these companies may require you to take the Bennett Mechanical test, they may also require you to take another assessment, interview, or participate in group exercises. It is important to take the test in a quiet, well-lit room. Make sure to have comfortable seating; an adequate desk; and comfortable positioning of the computer screen, keyboard, and mouse. Handbags, briefcases, and other personal materials are not allowed on or near the work surface. Examinees may not use reference materials, books, or notes to take the test, and such materials must be placed out of reach. What Does the BMCT Assess? Deduction of "how things work"